The UC Board of Regents debated an issue last month that has plagued the UC operational budget for over a decade: an ongoing budgetary gap between the expenditures of the UC Retirement Plan and UC core funds that may lead to an increase in tuition, even for California residents. If enacted, this could be the second tuition hike following the Regents’ decision earlier in January to approve the first increase in six years. Dianne Klein, a spokeswoman for the UC Office of the President, could not determine how much of the second tuition hike will be used to pay off pension costs, because both state and UC funds factor into the core funds as well. According to the most recent UC Budget for Current Operations report, these core funds — totaling $7.8 billion in the fiscal year of 2015-2016 — grant long-term funding for core mission and support activities such as faculty salaries, academic or administrative support, and student services. Employee and retiree benefits took up 19 percent of the core expenditures. When speaking to the Los Angeles Times, Klein addressed the issue by pointing out the retirement trend in recent years of baby boomers, particularly those with long tenures and higher salaries within the faculty. “UC, as you know, has an aging workforce,” Klein remarked. The UCRP currently provides lifetime retirement benefits for more than 56,000 retirees and has 128,513 active members as of last year. In fact, the Annual Financial Report for the UC retirement system last year confirms that the number of UCRP benefit recipients drastically increased in the past decade: from 37,289 retirees in 2006 to 60,178 retirees in 2016. Benefit payments for the UCRP were equally affected, with retirement payments costing $1,260,092 in the fiscal year of 2007-2008 doubling to $2,596,632 by 2015-2016. 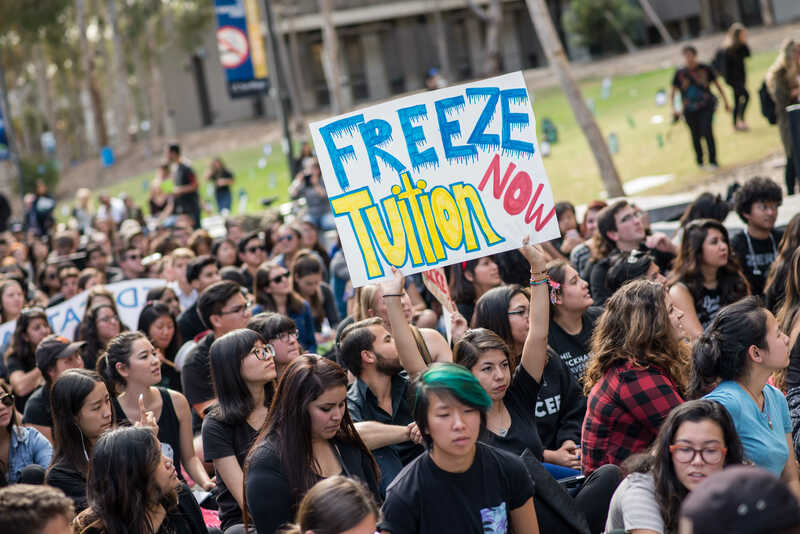 According to Lawrence McQuillan, a senior fellow at a nonpartisan think-tank called the Independent Institute, the tuition increase is certainly unjust for students, but it also necessary to safeguard the indebted UC pension system. The root of this issue can be traced back to 1990. At the time, the Regents overestimated the long-term sustainability of the UCRP because they had a surplus of funds from the state, UC employees, and members. They terminated all UC employee and member contributions, but without proper funding, the rising pension costs could not cope with the inevitable inflation of employees, students, and retirees over time. Even after they reinstated contributions in April 2010, capped pensions for new employees in exchange for state subsidies, and increased the minimum retirement age, the UCRP still has not become invulnerable to the current budget shortfall. McQuillan also argued against the speculative nature of UC public pensions and proposed a system of personal retirement accounts and higher salaries typically used in private medical institutions. “At least with a big salary, there isn’t this ticking time bomb that’s going to explode 30 years down the road,” McQuillan stressed. Despite the budgetary gap, an LA Times analysis of university data shows many UC retirees still endorse the UCRP. The number of retirees with six-figure pensions has increased by 60 percent since 2012. Up to three dozen retirees — most of whom were tenured doctors at the medical schools — collected pensions of more than $300,000 each in the past year. Nosratola Vaziri was one of the top recipients in 2016, receiving a pension of $360,000 for his 37-year tenure dedicated to UC Irvine’s medical school. He worked as a kidney and hypertension specialist, and made scholarly contributions to hundreds of scientific articles. The UC Board of Regents will meet again on Nov. 15 and Nov. 16 at UC San Francisco to finalize the budget for the next academic year. Im generally left leaning but anyone with 2 firing neurons should know that public institutions should not have pensions (nor unions) for the obvious reason that they are NOT a business. Pensions are countered by risk. That is the whole point to them. Since public institution have zero risk, pensions become nothing more than passing a liability on to children. This should be illegal. In fact, millennials and gen-x should absolutely not pay anything towards their parents decisions to pay these pensions. They had no say in the matter yet are footed the bill. I can understand debt for public infrastructure but not for guaranteed retirement plans.